ELIZABETH HART: There were two EP's, one remix record and one tape release, so yeah, there's been other stuff. NORRIS: It's interesting, because I think if people know the band's been together about eight years, and they hear "three albums in eight years," it might not sound like a lot. But there have been other releases and compilations over the years, so it's not like you haven't been prolific. TRES WARREN: The first album (Dins) came out in '06. HART: Well, there was a seven-inch first, then a 12" and then the first record. WARREN: And there was a CD, a compilation of stuff that came out before the record. NORRIS: When did you start in earnest working on songs forHazed Dream? A long time ago? WARREN: It was kinda quick. NORRIS: I know this was something of a different process this time. HART: Yeah, I really was. This was, Tres was writing a bunch of songs and he would demo and stuff, and I would get with him and write bass parts to accompany it. And in the past, the approach has been more the whole band getting together and jamming, and kind of pulling things out of that and really forming the songs, and this was different. NORRIS: Things were more formed when you went in? HART: Completely, and prepared and fleshed out. NORRIS: Mirror Eye, the last record, was so improvisational. Was there a point this time where you made a decision and said, "Let's try a different approach"? WARREN: I think maybe we took that other thing as far as we could take it, and wanted to try writing music in a way that was more unfamiliar to us, actually writing a song, and not some kind of improvised approach. And I think we did that for Mirror Eye and for some of those smaller releases, and I think it was kind of like a time to go back to a more condensed, "song" kind of idea. NORRIS: Maybe it's the result of the different approach to this record, but there aren't any nine- or 11-minute songs this time. Was there a decision to keep things tighter and more compact this time? WARREN: Yeah, I think there wasn't any kind of hard rule. If we'd had a nine-minute song that we liked, it would've made it on there. But everything just ended up being kind of short and more condensed. NORRIS: Have you been playing many live shows yet with the new songs? HART: No—that's another thing different this time, is that we'd written and recorded so many of these before they'd ever been played live and they haven't been yet. And in the past there were jams or things we were working on, and a lot of times they'd get fleshed out live, worked out in a live scenario. And this was like the opposite. So we haven't gotten sick of the songs yet! NORRIS: Hazed Dream is about as good a description of the sound of a record as I have heard in an album title this year. And yet "hazy" is an adjective you come across time and time again in write-ups of indie records nowadays, and not just of psychedelic or stoner rock bands, but even among synth guys and bedroom-pop kids. The love of effects has just made it so that every other record I listen to is "hazy." WARREN: Yeah, and I like a lot of that stuff, the bedroom pop that you're talking about. I like weird, psychedelic singer-songwriter kind of stuff. NORRIS: The Austin band Pure X reminds me a bit of you guys, especially the way their singer Nate and you, Tres, both seem to like your vocals real buried in there, creating this blunted, woozy thing. WARREN: I don't know, I was intentionally trying to have them kind of loud on this record. Maybe on the next record people will be annoyed by it because they'll be so loud! I just think the songs were more important this time. These songs came out in a "sitting there with the guitar" kind of way as opposed to, you know, endless jamming. So a lot of the words kind of came with progressions, the melodies came with the progressions and so on and so forth. NORRIS: There's more guitar and definitely more organ this time. It's definitely one of the more prominent instruments on the record. WARREN: Yeah, just another instrument that could add melody and a new texture to the songs. And sometimes it was the second thing that would happen after the guitar, it would just be like, "I guess we should put a keyboard part on" and then, "I guess we should put another keyboard part on." NORRIS: Not so much synth, though. I know Jimy has split since the last album. How did that come about? HART: After the last tour, which was two years ago, there were a lot of problems. He was kind of a travel liability, I guess. NORRIS: Touring was the issue, more? WARREN: Uh, going to jail was probably the deal breaker, at the end of it. HART: Yeah, there were some issues. 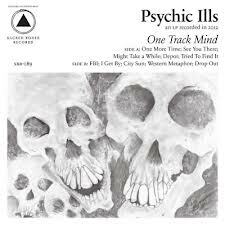 NORRIS: He was not the only "fourth member" of Psychic Ills over the years, though. Have you reached the point where you've decided it's just gonna be the three of you? WARREN: Maybe, who can predict? HART: But we're playing with some pretty awesome people right now for the live show. We've got our friend Dan playing guitar. WARREN: And our friend Brandon, who plays sometimes in Indian Jewelry, is playing keyboards. So five people right now, live. NORRIS: You've got a few CMJ shows coming up. HART: On the 20th, we're playing the Life or Death PR showcase at Cake Shop, and then the next night, on the 21st, is the Sacred Bones showcase at St. Vitus and it's also our record release. NORRIS: And you've got Halloween show coming up with Black Angels, who you've known for a while. HART: Yeah we played with them for the first time in like 2006 in Austin. NORRIS: Now, they're a band that kind of willingly embraces the term "psychedelic"—even to the point of hosting the "Psych Fest" in Austin. How do you guys feel about the term, which has been applied to you plenty over the years, but doesn't seem to really do justice to everything that you do musically? WARREN: I don't mind it. I don't get too worked up about that type of thing anymore. A couple of years ago I might have gotten wound up about a label or some band comparison. But generally people mean it in some kind of complimentary way, or some way of associating the music, just to describe it to somebody. It's fine.